At Cisco’s Karma we pride ourselves on only using the best products available. As we are ethically minded and care about the environment we have recently taken on a new range of Organic products which contain less chemicals and more natural ingredients, whilst still providing the wide range of Redken products that has been the foundation of our style philosophy. Organics Control Systems are the first range of styling products that are completely plastic-free. Bonds made with traditional plastic-based products tend to be brittle and break under vigorous movement. This causes your hairstyle to lose its shape and need restyling or touching up to maintain a freshly styled look over the course of the day. The unique formula of naturally derived ingredients used in Organics allows the hair to move, while maintaining its natural look and feel. The result is exceptional curl memory, dynamic curl retention, anti-frizz and lustrous shine. Beginning in 1960, Redken revolutionized the professional salon business by introducing the concept of protein reconditioning. Based on evidence that hair is composed primarily of proteins, and can absorb topically applied proteins, Redken developed new protein based products which allows salons to condition hair internally and for the long-term rather than solely camouflage damage. 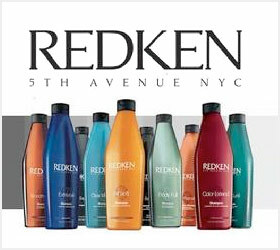 Redkens extensive range of products cater for straight and curly hair, can add texture, volume and shine to hair, and protect hair from heat styling and have long lasting hold.